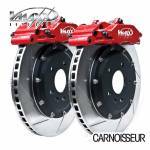 Browse through our collection of big brake kits here at Carnoisseur, which includes top-quality equipment from V Maxx. The larger pads and discs on big brake kits mean that your car will benefit from a shorter stopping distance and enhanced heat dispersal. Find the best big brake kit for you and make a purchase online today. You can also visit your nearest outlet and shop the range in-store, with full fitting facilities available at most outlets.